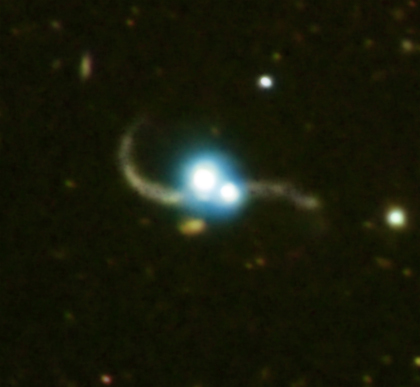 This composite image shows the effects of two galaxies caught in the act of merging. A Chandra X-ray Observatory image shows a pair of quasars in blue, located about 4.6 billion light years away, but separated on the sky by only about 70 thousand light years. These bright sources, collectively called SDSS J1254+0846, are powered by material falling onto supermassive black holes. An optical image from the Baade-Magellan telescope in Chile, in yellow, shows tidal tails - gravitational-stripped streamers of stars and gas -- fanning out from the two colliding galaxies. This represents the first time a luminous pair of quasars has been clearly seen in an ongoing galaxy merger. "Quasars are the most luminous compact objects in the Universe, and though about a million of them are now known, it's incredibly hard work to find two quasars side by side," said Paul Green, from the Harvard-Smithsonian Center for Astrophysics in Cambridge, MA, who led the study.